If you have been arrested for a DUI in Baltimore City, do not gamble with your future. Contact the lawyers at The Herbst Firm for a free consultation at any time. Day, night, or even weekends an attorney will answer the phone and will offer a free consultation. Baltimore is the largest city in Maryland, with a population of over 600,000. It is an independent city, meaning that it is not part of another local government such as a county. It is not a part of, and has no official affiliation with the any county govenrment. The population of the city peaked in the 1950’s when it was one of the largest and busiest port cities in the country. The harbor is still a major port, and the largest in the Mid Atlantic region, but a decreased focus on manufacturing in the area has led to the harbor becoming less of a national hub. The population has declined almost one third since the 1950’s, but like most urban areas in the country, there have been signs that this trend is reversing. Urbanization and a financial commitment to modernize the downtown area have lead to a recent increase in the city’s population. The population of the metropolitan area, which included the surrounding counties, has experienced steady growth. With a population of almost 3 million residents, the metropolitan area is the 20th largest metropolitan area in the country. The city has its own police department and State’s Attorney’s office and numerous courthouses. The justice system is serviced by district courthouses on Wabash Avenue, North Avenue, Patapsco Avenue, and East Fayette Street. The circuit court for is located on N. Calvert Street in the downtown area. The district courts handle all misdemeanor cases unless a jury trial is requested. For example if you are arrested for a DUI your case will be assigned to one of the district courts, but if you request a jury trial your case will be sent to the circuit court on Calvert Street. 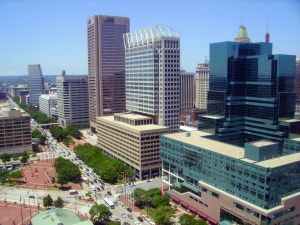 Baltimore City gained a great deal of notoriety for drug crime and violent crime when the television series The Wire gained national popularity. Law enforcement and prosecuting lawyers have worked to reverse the negative image that the city has had since the 1990’s when it was one of the most violent cities in the country. In 1993 there were a record 353 homicides and almost 22 thousand incidents of violent crime. The violent crime levels have decreased considerably since the mid 1990’s, but there is still has a much higher rate of violent crime then most metropolitan areas. Much of the credit for the decrease in the violent crime levels has been attributed to the city’s focus on keeping repeat violent offenders off the streets. While violent crime such as robbery and homicide in the city is on the decline, other crimes such as drug possession and drug dealing have not declined at the same rate. Drugs such as cocaine, heroin, and marijuana have become more prevalent. DUI is another crime that has not decreased at the same rate as violent crime. If you have been arrested for any criminal or traffic infraction contact Benjamin Herbst at The Herbst Firm for a free consultation.